Karma suggests that our thoughts and actions are the cause of what we receive. And, what we receive is the effect of those very thoughts and actions. Said another way: what you put in the world (good or bad) comes back to you. It’s like a giant boomerang. My grandfather taught me about karma very early. He taught me to choose my perspective carefully, and forgive easily. I also learned how to focus on the positive, and look for the good. Last month I shared research about a pending economic downturn that is likely to impact job loss. 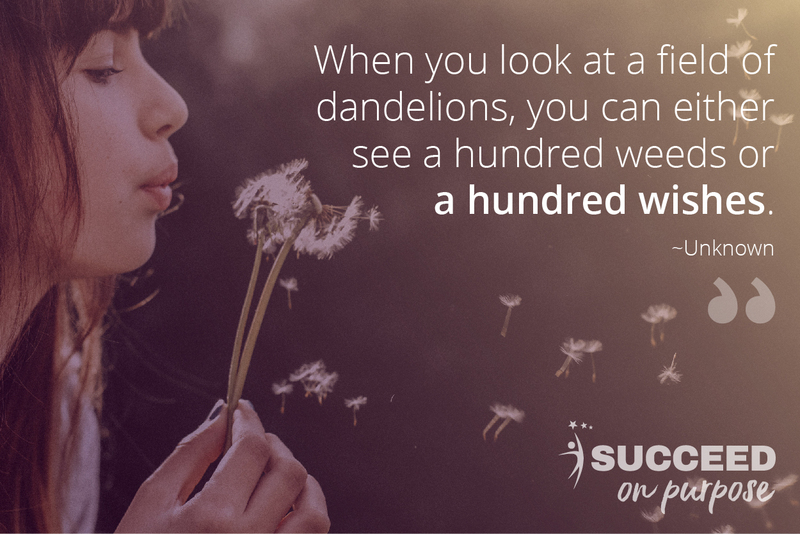 To support our Succeed On Purpose community, we will share tools to help each of you change perspective and look for the positive outcomes from any change that may come. I was a point guard on our high-school basketball team, and experienced a humiliating defeat. Quick to blame, I furiously stormed out of the gym angry at the coach for taking me out of the game after my emotional melt-down on the court. The following day I recounted the on-court challenges to my grandfather who quickly instructed me on the Law of Focus. He shared a huge insight that has shaped my life: “You get what you focus on.” Winners focus on the goal in front of them, rather than the obstacles in their way. I am frequently asked to recount this inspiring story, as there is something timeless about his advice. You get what you focus on. So, when things aren’t working the way I expect, I shift my focus to what I want to create, rather than what is going wrong. I put my energy and focus into my desire and/or vision. In addition, I trust implicitly, that any challenges experienced are not a denial of my goal, but are there to prepare me for my good. So, if you don’t like your job…what are you focused on today; what isn’t working or what you want to create? And, if the economy goes south and jobs are indeed lost, what will you focus on - fear of those changes, or the good/opportunity that can come from them? You MUST have passion for what you do. I’m not talking about loving every single day, or every little thing, but you must love your life and your work. 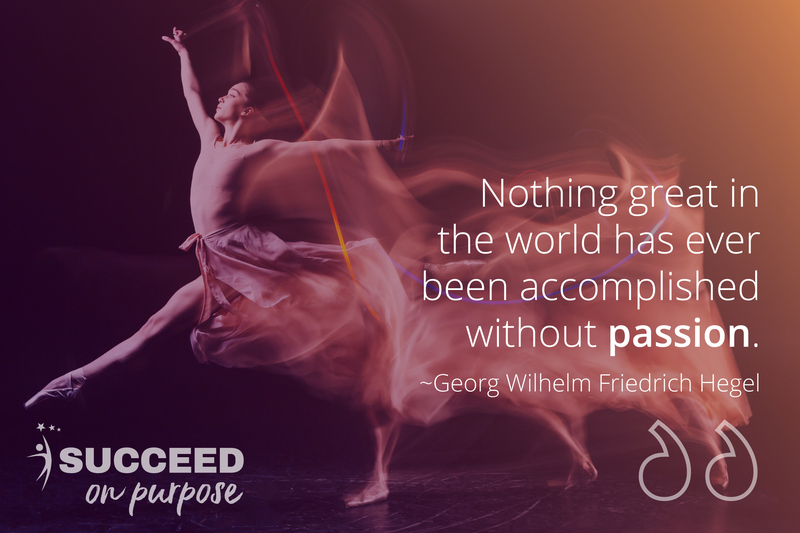 It’s that type of passion that precedes success. When you love what you do, work isn’t work. It’s fun. This will eventually translate into success, and executives can tell when you’re motivated and when you’re not. Leaders want teams who are passionate. Passion is the love language of the soul. We didn’t come to this Earth to be miserable; we were born to experience the joy that results from living passionately. To do that, you must LOVE what you do. Take an inventory: What are you doing that you’re not passionate about? Which parts of your life or work feel like drudgery? Either change it, or change your perspective about it. We’ve all heard the saying “patience is a virtue” and “good things come to those who wait.” As a person who prefers to do everything fast, I am not fond of those sayings. But, they are true. All rewards require initial toil, and success takes time to unfold. Rewards of lasting value require patient and persistent toil. We usually wish for success to come faster, but if you want the quest for success to be simpler, learn how to do things in “God’s time,” not your time. (I am speaking from a ton of experience here). So, how do you chill out, and co-create with the divine? Simply take your focus OFF of how long something is taking, and put your energy into the joy of what you’re doing. True joy comes from living a purposeful and authentic life, while trusting that the rewards will come in their own perfect time. Our soul is designed for more. As humans, we have unlimited potential and unending new desires. To reach our potential, it is not about doing more, or having more…but instead, it’s about BEING more. This natural hunger for more is frequently misunderstood. We mistake this inborn thirst for more as a hunger for more stuff, more food, more work, or more money. When we misread this soulful hard-wiring for more, we tend to focus on the wrong things. The Law of Potential is about the soul wanting us to BECOME more. It wants us to grow, stretch, and push past boundaries. Much like a seed that was born to grow, our soul desires to learn and grow. It desires more. It wants to become more and maximize our human potential. Who are you at your core? Do you know your purpose and your career persona? Do you know what your passions are? Are you using them? Are you the best you that you can be? Are you pushing past fear? Remember, the Law of Potential is a natural law. It’s how we are designed. This last karmic career law sums up all of the others. The Law of Perspective states that all things work towards our highest good; even pain, loss and heartache. Good can come from anything. Imagine that you lost your teenage daughter in horrible accident on a family ski trip. She was your first born, the apple of your eye, the love of your life, and the heartbeat inside you. Nothing could ever take that pain away. How on earth could good come from something so horrible you ask? Because you look for it. Recently I met the Storch Family, who experienced such loss. They made the gut-wrenching choice to donate their daughter’s organs and saved countless lives. But, they didn’t stop there. Through their grief, they uncovered that there were no family support systems to help families AFTER they donated their loved one’s organs. All of the support infrastructure was designed to help families before and during the choice to donate organs, but not after. Looking only for the good that could come from their loss, and despite their heartache, they founded Taylor’s Gift to raise money for family assistance and care after the organ donation process occurred. Think about that. They lost their child. And, they looked for the good. I am proud to support Taylor’s Gift and the Storch family because it reminds me that perspective is everything. LOOK FOR THE GOOD. You get something back from whatever you have put into it. If you don’t like the way things are turning out, look for the good that can come from it. The true value of something is a direct result of the energy that is put into it. No matter how bad it is, there can always be good that can come from it. Succeeders…we’ve been through a lot together since I started this crazy dream in 2009. I started Succeed On Purpose, and what is now Share On Purpose, from one of the lowest points in my life. Yet, look at the good that came from it. Look for the good. Change your perspective. Be patient, it will come. Find your passion. Let the more you seek out of life be focused on your potential to be more. 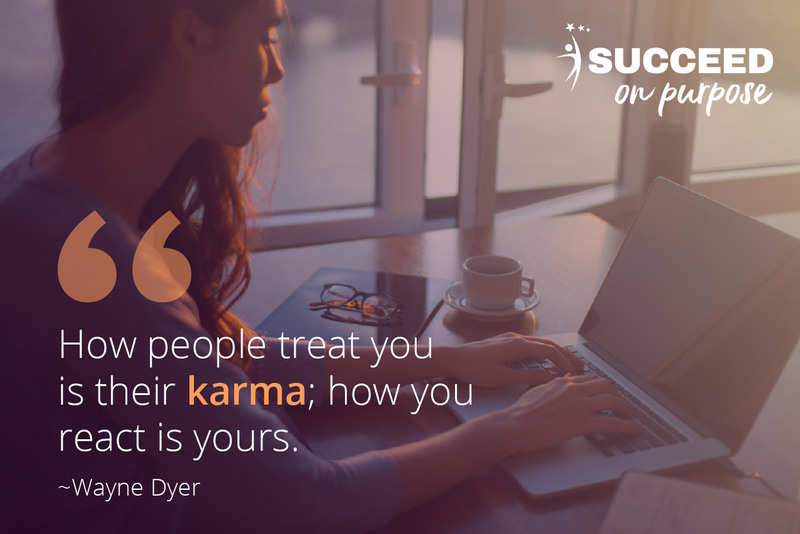 In the spirit of putting more good into the world, please pass these 5 Rules of Career Karma on to those who may need it.